Sprinklers are simple devices that are individually operated by the heat from a fire. When a fire starts hot gases rise. If a sprinkler is present, a glass bulb or solder link gets hot and at a specific temperature breaks, releasing a cap and allowing water to flow onto a diffuser. The diffuser breaks up the water flow into carefully controlled droplets which penetrate the fire and cool the burning material to below its ignition point, thus controlling the fire. Only the sprinkler(s) directly over the fire are operated. Foam suppression is used where flammable liquids or plastics can catch fire. The fire spreads very quickly and toxic combustion gases are emitted. Foam is used as a blanketing and cooling agent, coating the fuel to prevent contact with oxygen. 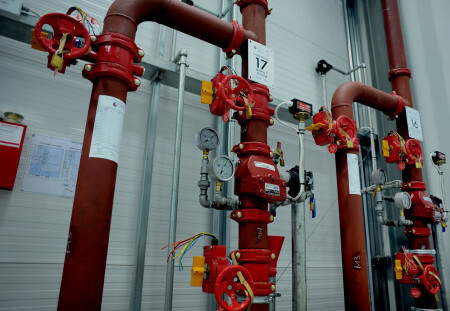 Sprinkler systems are usually designed to protect the whole building. Deluge systems are used in rooms with high ceilings to quickly wet down an entire area in facilities that contain high flammable liquids and chemicals. Fire hydrants are installed on properties to enable the fire service to have instant access to a local water supply to limit the spread and extinguish the fire. Fire Hose Reels are designed to provide a large, continuous, controlled volume of water to fight fires. Dry risers are used to supply water within buildings for fire-fighting purposes. The provision of a built-in water distribution system means that fire fighters do not need to create their own distribution system in order to fight a fire and it avoids the breaching of fire compartments by running hose lines between them. Dry risers do not contain water when they are not being used, but are charged with water by the fire service when necessary. Wet riser systems are very similar to dry, except that they are permanently charged with water. They are used where floors are over 50m above the Fire Service access level and where supply pressures exceed those of the fire appliance. The most successful and dependable way to protect your property from fire is to fit a sprinkler system. It provides automatic detection, alarm and firefighting capability at all hours of the day and night, 365 days of the year.